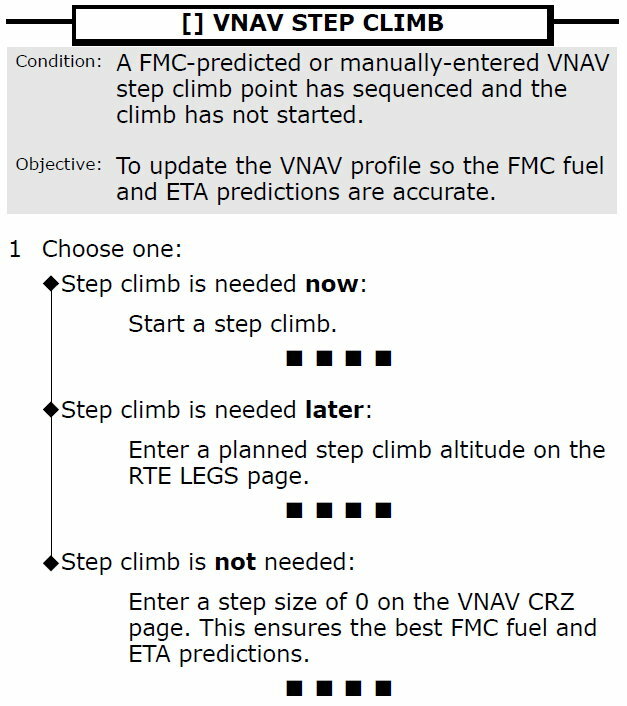 The introduction of the  VNAV STEP CLIMB checklist highlights procedural handling of EICAS/ECL and the management of enroute climbing in the aircraft. 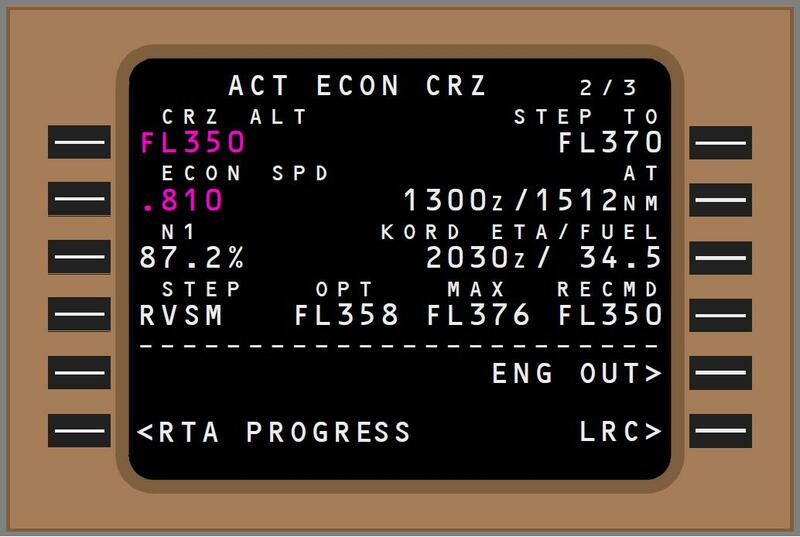 The FMC schedules step climbs throughout the flight based on the settings in the Cruise Altitude (CRZ ALT), Step Size (STEP) and potentially Step To (STEP TO) fields based on the aircraft weight, actual/forecast wind and temperature data and speed schedule (usually cost index). 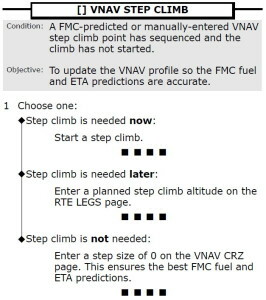 Additionally climb steps can be placed on the LEGS page of the FMC to schedule climbs at geographical waypoints in the flight plan, rather than the optimal weight/speed/wind schedule predicted by the FMC. What this all means is that for a long flight the FMC assumes that you will be able to increase your altitude as the flight proceeds, and calculates ETA and Fuel at Destination accordingly. I remember when I first checked out on the 777, standard practice in my airline at the time was to set the Step Size to Zero during pre-flight and keep it there. In this way the fuel/time predictions for destination would be based on not getting any climbs – after all, how can you predict time/fuel based on climbs you may not get? At the time this was considered “conservative” and therefore safer. For shorter flights this was indeed unnecessarily conservative. For longer flights, it meant operating for half the flight with an “INSUFFICIENT FUEL” message flooding the CDU scratchpad … eventually wiser heads prevailed and we returned Step Size to the default value – which at the time was ICAO. The “risk” here is that you may not get the climb(s) you need, but the FMC continues to assume you will. Indeed, if you pass a step climb point and don’t get a clearance, the FMC continues to calculate time and fuel assuming you’re just about to start a climb to the next step. This has been part and parcel of FMC’s of this type for decades and pilots haven’t been overly burdened by the requirement to monitor flight progress, seek climbs appropriately and deal tactically/strategically when we don’t get them. 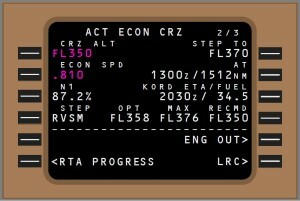 For whatever reason, Boeing have implemented an EICAS message when the FMC Step Climb point is passed without an associated climb. This message, rather than just prompting crew to seek a climb, also comes with a full EICAS NNM checklist – although how this can be called a non normal is beyond me. Purportedly this iniative came from the FAA’s involvement in extending ETOPS approvals for the 777 beyond 180 minutes. Rumour has it the checklist will benefit from further refinement in future blockpoint updates. Long haul pilots tend to be pro-active about climbing and often seek climbs prior to the recommended step climb point. This is usually in an effort to avoid being blocked from higher levels by the increasing numbers of other aircraft on the more common routes. If you can get up there earlier, you’re more likely to be the one blocking, rather than finding yourself blocked from those fuel saving altitudes. Do it too early though and you’re punishing yourself, with deviation from optimum altitude typically being a 2:1 ration against being high – that is, you are approximately equally less efficient being 2000 ft above your optimum level as you are being 4000 ft below it. Another is setting the step size to an increasing value, or to set the Step To altitude higher than 2000 (RVSM) or even 4000 (ICAO) to delay the climb reminder. Another is to ignore the EICAS and leave the message there until you get your step climb. While definitely within the purview of the crew – this response doesn’t keep a clear EICAS which is something we actively encourage. Another is to override the checklist instead of running it. 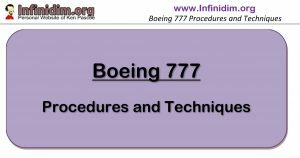 This is definitely no recommended, since you’re effectively removing the checklist (if not the message) from serving it’s intended function – dealing with a situation on board the flight deck that the manufacturer has decided you shouldn’t be ignoring. – Step climb is needed Later? – Use the LEGS page to delay the Step. – Step climb is NOT needed? – Remove all Step Climbs by entering 0 into the FMC VNAV CRZ page Step Size. – Step Climb is Needed but ATC won’t give it to you? Ok then …. The last action in the actual checklist (Step Size Zero) of course removes all reminders that a step climb is ever going to be needed for the rest of the flight, and is typically only the relevant choice towards the end of the flight when you are either unable to obtain or decide you don’t need that last increase in altitude. Setting 0 in the Step Size too early in a long flight will give you a falsely low estimate of fuel on board at destination (which contrary to common belief may not be the most conservative indication); as well as potentially an inaccurate estimate of your arrival time. Finally – find yourself forced down this path early enough and your FMC will continually be telling you you have INSUFFICIENT FUEL all the way to your destination (or not); or at least until you do get a climb. And we’re back to my Airbus airline of the mid 90’s that couldn’t learn from it’s Boeing pilots. In the end this conundrum of what action to take when you aren’t able to climb straight away – or at all – enroute is something pilots have be dealing with since ATC was invented. I’m not convinced we needed a checklist to highlight it to us.